Do you remember the song "Grandma Got Ran Over By A Reindeer"? There is a line in there at the end that says after the whole ordeal "... as for me and Grandpa, we believe." I had my believer's moment in 2001 when it comes to the supernatural. My grandmother was in town during a rare visit. You see, this trip would be on of the first where she was able to meet up with her brother-in-laws. Father Frank and Father Jack worked in the Catholic church back home in Vancouver. They were all getting up in age but it was a time for me to get to see all of them in the same setting for the first time. My brother arranged a tour of the strip in a limo and we had a dinner at the Palace Station. It was during dinner that I thought to ask something that had been in the back of my mind for some time. Dinner was already served and I turned to one of the fathers (my great uncles) and mentioned the recent re-release of the film The Exorcist. I asked him how he felt about the film. He said, "They usually aren't that violent. But you might want to ask my brother as that's his job." My jaw dropped. Sure, if I went to church and heard that, I'd expect it of someone that wasn't family... but not this. Especially with an answer with the calm demeanor of someone not phased by the question. I also didn't think the church would want him to be that open about it. So, I talked to him for a little bit. He mentioned that he was being called out to a lot of nearby Canadian Indian reservations to help these spirits make their transition. When many of these cultures pray and praise the spirit of the wolf, eagle, dog, horse, snake, bull and all manner of beast, some get lost on the way. Anyhow, that is when he told me this story. A man leaves work early and comes home to find his wife in bed with his best friend. The husband was shot in the process and died. The widow and former-best friend are now living together. It was after a few he moved in that things started happening around the house. The gate leading to the house would open and close (with no wind in the area.) The doors in the house would not stay shut. This would happen every time the new man of the house would come home. The wife was in a panic and it wasn't helping their relationship any. The father resolved this one rather easily but told me that sometimes a spirit stays in a place it held most dear and only wants to not be forgotten. Of course, my interpretation was that he was asserting his ownership of the home by reminding the 'man of the house' that it wasn't his upon his arriving there. There are a lot of ghost stories out there and I've written a few myself. But, having confirmation from someone that works in that area for a living... helped me accept it more. Of course, I find many people have personal experiences with the supernatural. Usually, I just listen, smile and think back to talking with Father Jack and Father Frank Hennessy on a random topic and getting an answer that I didn't expect. I guess as for myself, the fathers and a few others out there, "we believe." Don't let the haircuts and the unusual video make you question yourself. The Hoodoo Gurus' song I Want You Back is an example of pure pop rock. The Australian band did a little better with their song, "Come Any Time," on the U.S. Modern Rock chart but I have always felt chart placement is pretty subjective (especially when one includes radio, doesn't include single, includes ringtones, doesn't include club play, etc...) Great guitar here, strong hook, personal lyrics and the answering backing vocal just rocks. I wasn't able to really discuss what happened until it aired but now I can give an inside look at what it is like being a phone-a-friend. This was actually my second time. You see... you are allowed only 5 phone-a-friends to be listed when you are a contestant on Who Wants To Be A Millionaire. You can only be a phone-a-friend two times in a season. To be eligible, you must be at the phone number (land line preferred) for the entire taping of the show. The production team call early in the morning in a conference call with all that contestant's PAFs (we'll abbreviate that from here on) to give instructions on how to answer the phone, when to expect a call, etc. And then you wait. My good friend Daniel was on the Oct. 19th and 22nd episodes of the show (which was recorded some months ago.) The plan was to have a call center (with several of us in on one call) and a few other PAFs. Daniel and I set up a system for my house with a speaker-phone (with microphone taped) to be left in my bedroom near the computer while the person answering the phone would remain in the kitchen area nearby. This would allow all 3 to hear the question and respond right away if they knew the answer with the fall-back option of having one person on the computer that can search for an answer -- and relay it to the extra person over to the phone-man. Make sense? Ok, our plan had myself on the computer (because I type really fast and search for things constantly), David on the phone, Kevin and Dan's girlfriend Robin inbetween. As you can see from the photo, that is when we got the call that Dan was in the 'hot seat.' We sent someone to let Robin know and patiently awaited the call while everyone got to their battle stations. The call came sooner than we expected and Robin hadn't come back yet. Everything went well up until we heard the question. None of us knew it off the top of our heads. That left David to searching, Kevin to run the answer to me and I needed to stall for time. So I asked him to repeat the question. Suddenly, I heard Kevin coming around the corner and I relayed it into the phone. I then heard a click. We regrouped at the computer and told them that it sounded like it got through. David wasn't too sure of the answer that he relayed, though. So I hopped online and searched for a bit. (You see, they told Daniel that they purposely write the questions so they will be hard to search for as they know it will happen.) We found we gave him the wrong answer. Moments later, Robin returned and we told her what happened. In my head, I'm thinking... "Did I sound too sure that that was the right answer? I hope not." Well, if any of you caught the show, the phone cut off right after he repeated the question. You see, Daniel had a plan that he didn't tell us about. He didn't expect the search to work in time and if we didn't know it right away, he'd move on. We spent several hours thinking we cost him $25,000 and a chance at more but later (as seen on TV) switched questions. Quite an experience. Congrats, Dan! I am slowly coming to the realization that it will take me more than a month to finish reading Atlas Shrugged. I really thought that 1184 pages would go by quicker than this but it's a damn good book. I feel really bad that I haven't gotten back here to post recently. Things have been a little crazy. Hopefully, it'll be smooth sailing after the end of the month. I was notified by my neighbor across the street that I had a fire. Of course, I'm thinking that this is going to ruin any chance of selling the house. Essentially, the bushes under the pine tree in my front yard went aflame. She thinks that someone tossed a lit newspaper between them and the neighbor's trailer (yes, there is a trailer in their front yard.) I'm thinking the burning bushes were waiting for me to get home to reveal my purpose in life. I'm just hoping they will recover soon as they look pretty sad right now. I told you about my friend Daniel going on Who Wants To Be A Millionaire. Well, that airs on Friday. I can't say anything until it happens but I'm thinking there is a definite blog-post about the behind-the-scenes is in order. The Marty Hennessy Junior Tennis Foundation held another fund-raiser on Sunday. I stopped in and talked to a few people (Tony Bennett, Rudy Ruettiger, Jack Jones and a few others) and scrammed before dinner was served. I gave blood earlier that day and I wasn't feeling so hot. But I am finding it funny that many news outlets are calling it the Marty Hennessy Jr. Tennis Foundation. As, I loathe being called that and that it's about junior tennis and not about Jr. Heck, most of them didn't spell Hennessy right anyhow. There is something about my dress shoes that always causes blisters. Doesn't work well for a job that I need to be on my feet. I decided to go to BloodHero.com to see what my cholesterol level was from my previous blood donation. It didn't look good (really bad actually) but I was told that those are usually off as a fast prior to testing will give a better reading. Anyhow, it's urged me to have oatmeal every morning and give up indulgences like these. I heard that we got a few calls on the house but no visitors yet. In a market like this, I expect it. What I also expect is that while the value of my house drops, so will the one that I purchase next. Got a lot of prep-work for the podcast to do tomorrow. So little time. This week, is Bangle-focused. I feel bad that the interview with Debbie Peterson didn't work out (wasn't able to record the call.) But she's fun to talk to and I'm hoping to get another try when they release their next album. Otherwise all is great. I gotta run and get that humidifier now. Upon searching for videos for the songs on YouTube, I had no idea that so many were used to express a gay relationship. I can see why though. These are powerful and intense performances. The previous video alluded to a relationship between characters of a show I have been recording but haven't watched yet and this following one does something similar (between twin brothers) from an anime series. It might be more worthwhile to open another tab or browser and listen to the song in the background... or even close your eyes. "Don't Need Love" don't need no stinkin' video. I know. You are looking at the photo and thinking that I really like my M&Ms. For awhile, I'd grab a bag of them (gotta have the peanuts in there) at work for desert. Anyhow, I was at work one day when a co-worker brought up an idea that's been circulating which will get rid of the penny. My biggest issue with the idea is that someone will gain or lose more in every transaction while rounding up or down (when adjusting values to the nickel.) The co-worker was mentioning to me that it costs more to make a penny than it is worth... so why not replace it with something else, like an M&M, as they'd be cheaper to make. Definitely on the crazy side, when it comes to ideas, as inflation eats at the value of our money but children would be tempted to nibble on your change when they find it. They also go bad, crack and break (as the blue one in the picture on the left.) Yet, that wasn't my response to him on the idea. I just asked him what we would do with the two-cent pieces. He was kind of shocked when I asked it and said, "There aren't any two-cent pieces." I replied, "There would be. There are conjoined twin M&M's that occur fairly often." To prove this, I collected two week's worth (one bag per day) and they are pictures above. Yes, in ten packages, I had five of these anomalies. Whether our money gets adjusted in the future, I don't see it becoming candy. 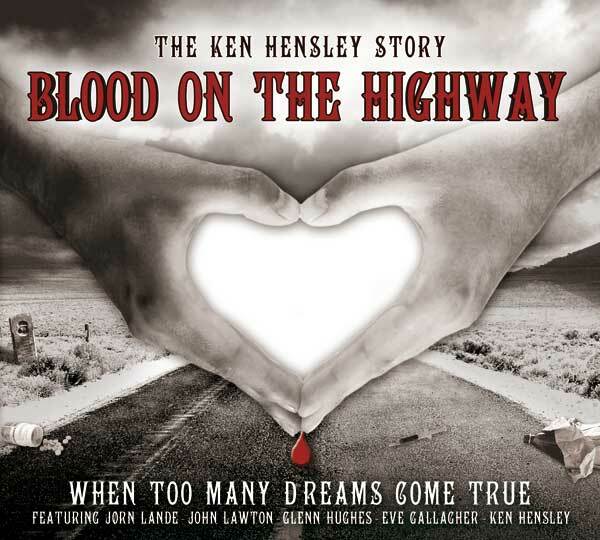 Keyboardist, guitarist, singer, songwriter and producer Ken Hensley has returned with his new concept album, Blood On The Highway: When Too Many Dreams Come True. The album is a companion to a book of the same name that also tells the story of the rock & roll dream as recounted by former Uriah Heep member Hensley. If ever an album screamed "make me into a musical production" before, this warrants it. The appeal of seeing, hearing and feeling the rise of a rock star, the fears, the betrayals, the relationships that isolate, temptation, redemption... it's all here. The album sings to life with the opening strains of "(This Is) Just The Beginning." All rock bands start from the dream whether it's to play in front of thousands of fans, to put out an album or to write the perfect song. A line from the song says it all: "Give me five guys that can rock, who don't know how to stop. Send them ten times round the block just to add a little mystery. Give me radio with balls, someone to help us fill the halls. And we can grab ourselves a piece of rock and roll history." (Yes, this alludes to the 5-piece classic Uriah Heep and their manager Gerry Bron.) The track sets the stage for "We're On Our Way" telling of the group's touring and ascent. I'm not going to ruin the story for you but what I can say is that there are some tremendous performances on this album which grows on the listener quickly. Former Trapeze/Deep Purple/Black Sabbath member Glenn Hughes, John Lawton (of Uriah Heep), Jorn Lande and Eve Gallagher provide compelling vocals on the disc. Being able to step back from a song and allow another vocalist to step in really says something about the confidence Hensley has in the songs and humility in the concept. Ken Hensley has presented the roller coaster that is rock stardom on Blood On The Highway in a package full of hooks, dynamic layers and deft songcraft. I can only wait to get my hands on the autobiography of the same name.